TL;DR - Kubernetes provides different capabilities in terms of scalability. This primer is the first part of a series that introduces you to concepts and how to scale your cluster & applications. This year I've started working with Kubernetes and one of my main focuses has been scalability and how it impacts your application & infrastructure design. It's an interesting space to look into, certainly if you add autoscaling to the mix. This series will walk you through the basics of the scalability aspects in Kubernetes and give you an idea of what it provides, how you can use it yourself and how you should design your applications to build your own scalable applications. This first article will explain what components are available in Kubernetes, how you can perform manual scaling activities and how you should design your application for in order to be fully scalable. Cluster Scaling - Add and remove nodes to the cluster to provide more resources to run on. This sort of scaling is done on an infrastructure level. Application Scaling - Influence how your applications are running by changing the characteristics your pods. Either by adding more copies of your application or changing the resources available to run on. However, before you can start scaling on an application-level, we first need to make sure that our cluster is providing enough resources to satisfy the application scaling needs. Let's have a look at scaling our cluster manually. 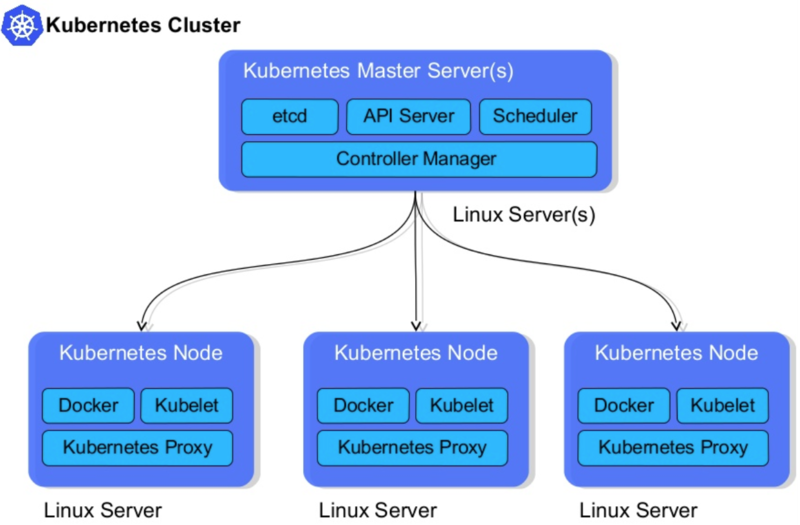 Kubernetes clusters consist of two types of nodes - Master & worker nodes. While the master nodes are in charge of providing a control plane for the cluster, managing the worker nodes and making sure everything runs smoothly inside of the cluster; the worker nodes are what we need to scale. These worker nodes are the nodes that will run your effective workloads. Every node runs a kubelet which is an agent that is used by the master node to manage workloads running on this node. More details about how the cluster works are beyond the scope of this post, but you can read more about it here. In order to provide enough resources for our applications, we need to make sure that our cluster has enough worker nodes to run all the applications on. Ideally, this is done before the cluster is reaching their limits. When we are overprovisioning the cluster, we should remove nodes so that we are not burning money without a cause. Most cloud providers allow you to easily perform these scaling operations with a single command. If you are running a bare-metal cluster, it is your responsibility to provision, manage and add nodes to the cluster. Now that we know how to scale our cluster to provide the resources that we need, we can start scaling our applications. In order to do this, our application needs to be thought through and designed to be scaled. The success of your scalabilities lies in your application composition and is crucial for building high-scale systems. In Kubernetes, your scalability unit is what is called a Pod. It is capable of running one or more containers which will be running next to each other on the same node. Pods are being deployed & managed when you create a Deployment. This specification will define what a pod is and what characteristics it needs and how many running replicas of them are required. Behind the scenes, the deployment will create a Replica Set to manage all the replicas for the deployment. However, it is not recommended to create & manage your own Replica Sets but to delegate this to the Deployment as this has more of a declarative approach. Imagine that we have an order microservices which exposes an HTTP endpoint to provide functionality to our customers. For every new order, we will validate it and store it. To achieve this, we will offload the persistence to a second process which will take our orders of a queue and persist them in an asynchronous manner. 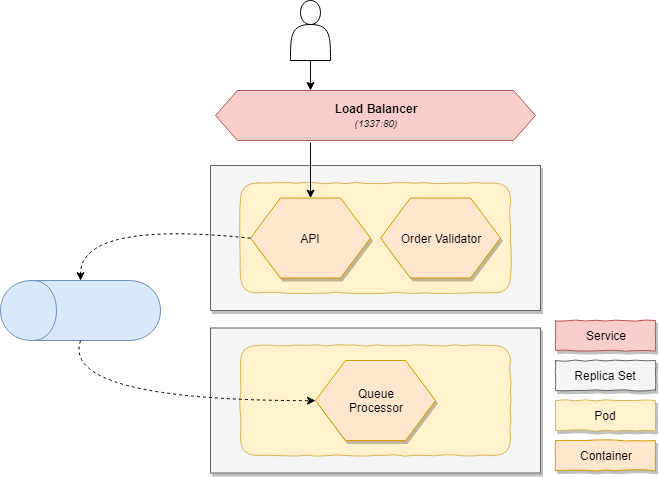 These two components also have their own scaling requirements - Our API will have to scale based on CPU & memory while our order queue worker will need to be scaled based on the amount of work that is left on the queue. This will instruct the deployment, which is actually updating the Replica Set, to change the number of requested replicas. In my reference application, you can find an example of the Order service running on Kubernetes. For the sake of the blog post, we will only deploy the queue processor but if you are interested, everything is available on GitHub which explains how you can deploy it yourself by following these instructions. In order to deploy our processor, we need to describe what it looks like and how it should behave. We want to deploy a pod which is running the tomkerkhove/containo.services.orders.queueprocessor Docker image. Next to that, we want it to run 3 exact replicas of our pod and use rolling updates as our deployment strategy. If you are interested, I recommend reading this blog post by Etienne Tremel. You can find more information about creating deployments in the Kubernetes documentation. That's it! The deployment will instruct the replica set to change the desired amount of instance which will request Kubernetes to either provision more instances, or instruct running pods to gracefully shutdown. We've learned that Kubernetes requires you to scale your cluster to provide enough resources for your application. Applications also need to be designed to be scalable and we've used an example scenario which shows you a potential approach to design, deploy and scale it. While we are now able to manually scale our cluster & applications, you do not want to be constantly monitoring them and wake up in the middle of the night to scale them. In our next post, we will have a look how we can automatically scale our Kubernetes cluster to ensure that it always provides enough resources for our applications. Kubernetes Cluster Autoscaler allows you to automatically scale your cluster by adding more nodes. This ensures that the cluster always provides enough capacity to run your applications on. Azure Event Grid is a serverless pub/sub engine for building event-based architectures, but how do you test your applications? Let's have a look.